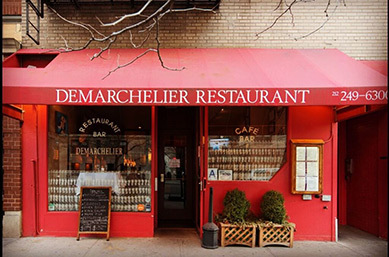 Demarchelier Restaurant Bar may be located at the corner of 86th Street and Madison on the Upper East Side of Manhattan in New York City, however its heart and soul, and its cuisine, is firmly and deliciously planted in France. 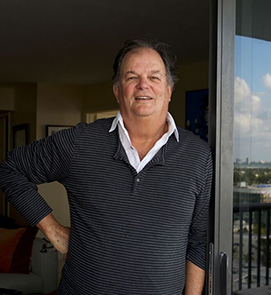 Since 1978 when French-American owner and painter Eric Demarchelier opened his eponymous restaurant, locals and visitors have gathered to celebrate French cuisine in a warm and inviting ambience. 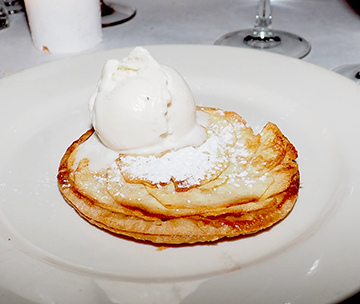 Now managed by Eric's daughter Emily Demarchelier, the restaurant is a Francophile's dream come true with the talented Chef Marc Tagournet in the kitchen bringing the essence of French cuisine to New York City. Bon Appetit! 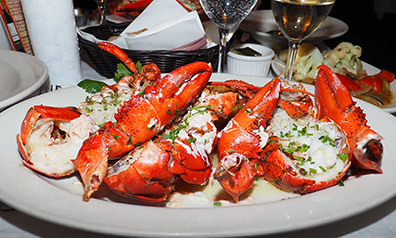 The lipstick red exterior of the restaurant beckoned invitingly to us and once we entered Demarchelier Restaurant Bar with its warm and charming ambience we knew that we had found a delightful gem on the Upper East Side. We dined at the restaurant on a very cold wintry Friday night in late January 2019 and were enchanted with the personality and character of the restaurant and its staff. Gourmets know that to truly dine well, one consumes the food first with the eyes, then savors the enticing aromas, and then finally, tastes the food. At Demarchelier Restaurant Bar there is an additional step, as the inspired contemporary paintings that grace the warm yellow walls by artist and owner Eric Demarchelier should be appreciated as well, and if a painting catches your eye it should be noted that the paintings are available for sale. A gracious and intimate setting, the restaurant invites conversation over delectable food as was apparent on the night we dined there. Burgundy leather banquettes line done wall of the restaurant, and if the hardwood floors could speak. oh what lively tales they would tell. Sconces bathed diners in a warm glow, black and white photography along with the paintings, and framed mirrors added interest to the long room. The restaurant has a collaboration with a Vermont cooperative and offers many organic items on the menu. 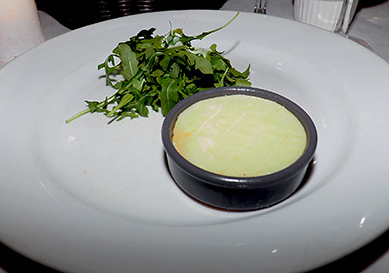 We began our dining experience with one of the specials of the evening, a starter of St. Albans cheese served warm in a pottery crock alongside an organic baby arugula salad. The St. Albans cheese was absolutely delectable. Made in Vermont from cow's milk, the pungent, creamy cheese served warm which we spread over slices of crusty French baguette was a dream. The arugula salad was a nice complement with its slight peppery bitterness. Paired with a Pouilly-Fumé, La Porte de L'Abbaye, Henri Bourgeois, Sauvignon Blanc, 2017, which was crisp, with an elegant bouquet of green apple and nice minerality, the starter was a perfect introduction to the restaurant's style. 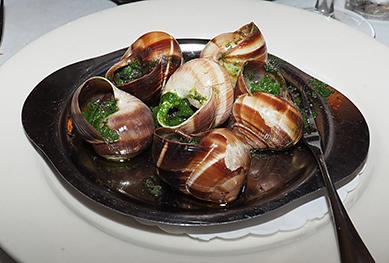 We also had the Helix Escargots de Bretagne with Garlic Butter and Herbs, which was excellent. We spent several weeks in the Burgundy region one year where (Edward's) daily indulgence included escargots. Demarchelier's version was every bit as tasty, and a lovely reminder of our trip. Paired with the "red wine of the month," Chateau Haut-Francarney, Canon Fronsac, 2015, made with 70% Merlot, 15% Cabernet Sauvignon, 15% Cabernet Franc, and aged for 12 months in oak barrels and 50% new oak, this full-bodied wine had enough structure to complement but not compete with the escargots. The restaurant has weekly specials, and on Fridays they serve Bouillabaisse, one of our favorites. 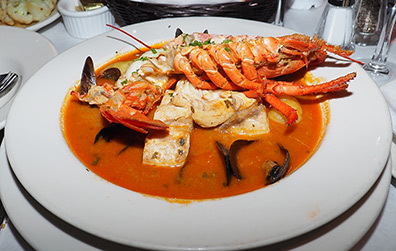 The bouillabaisse arrived with a plethora of seafood including half a lobster, and generous amounts of monkfish, swordfish, and mussels in a rich broth that begged for the accompanying crisp bread to be discretely dipped to absorb the amazing flavors. We also had the nightly special, which was one and a half lobsters in a beurre blanc sauce, that was hands down delicious. Sweet lobster meat delicately glazed with the beurre blanc sauce added flavor without the weight of the standard cup of melted butter. Presented with a grilled lemon, and accompanying vegetables of cauliflower, red and green peppers, onions, and zucchini in a tasty sauce, the lobster was fabulous. As we watched the orders come out of the kitchen enroute to the other tables we could not help but notice how wonderful the Cheese Fondue for two looked, as did the Duck Confit with White Beans, the Moules Mariniere, and the Sole Filet with lemon. Alas, another time. For the finishing touch to our wonderful dinner, we had the Tarte Fine Aux Pommes served with Vanilla Ice Cream, which was thinly sliced apples arranged in a concentric circle on thin, buttery pastry that was served warm and was oh-so good, and the Crêpes Suzette with Grand Mariner, long a dessert favorite of ours. 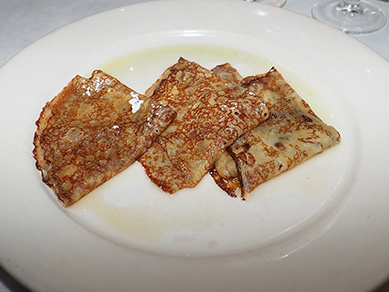 The delicate Crêpes Suzette were brought tableside where our server doused them with a generous amount of Grand Marnier and then ignited them. Both desserts were delicious and fully did justice to Chef Marc Tagournet's menu. From beginning to end, our dining experience at Demarchelier Restaurant Bar was a delight with outstanding cuisine from Chef Marc Tagournet and attentive service from our French waiter and the excellent Demarchelier team. Bon Appetit! Demarchelier Restaurant Bar serves Lunch Monday through Friday from 11:30 am until 4:00 pm, Brunch on Saturday and Sunday from 11:30 am until 4:00 pm, and Dinner daily from 4:00 pm until 10:00pm. In addition to the à lacarte menu, the restaurant offers a prix-fix dinner menu, and an Express Lunch Menu for those on the go. The restaurant also has weekly specials: Tuesday features Couscous, on Wednesday there is Duck à L'Orange, Thursday features Cassoulet, on Friday there is Bouillabaisse, and Saturday features Pot au Feu. 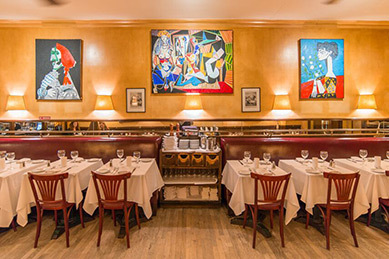 With its proximity to the Neue Galerie (1048 Fifth Avenue at 86th Street) and the Solomon R. Guggenheim Museum (1071 Fifth Avenue at 89th Street), Demarchelier Restaurant Bar is perfect for a pre or post-museum lunch or dinner. For more information on Demarchelier Restaurant Bar or to make reservations please visit their website: www.demarchelierrestaurant.com. Tempt your palate in the Chefs' Recipes section where Chef Marc Tagournet graciously shares his recipes for Helix Escargots de Bretagne with Garlic Butter and Herbs, and Moules Mariniere (Mussels Mariniere) until you can personally experience the restaurant. © February 2019. Luxury Experience. www.LuxuryExperience.com. All rights reserved.